Originally published in 1907 and now reprinted for the first time, this is the only account published by a Union guerrilla in the border region of the central Ozarks, where political and civil violence lasted from the Civil War well into the 1880s. There were probably many people who wanted to shoot Billy Monks. He was a Union patriot and skilled guerrilla fighter to some, but others called him a bushwhacker, a murderer, and a thief. His was a very personal combat: he commanded, rallied, arrested, killed, quarreled with, and sued people he knew. His life provides a striking example of the cliché that the war did not end in 1865, but continued fiercely on several fronts for another decade as partisan factions settled old scores and battled for local political control. This memoir was Monks’s last salvo at his old foes, by turns self-defense and an uncompromising affirmation of the Radical Union cause in the Ozarks. The editors include a new biographical sketch of the author, fill in gaps in his narrative, identify all the people and places to which he refers, and offer a detailed index. Monks himself illustrated the volume with staged photographs of key events re-created by aged comrades who appear to have been just barely able to hoist the muskets they hold as props. John F. Bradbury is the senior manuscript specialist at the Rolla branch of the University of Missouri Western Historical Manuscript Collection. 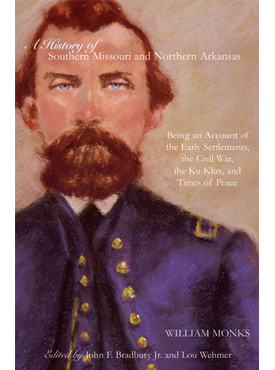 He is the author, editor, and compiler of many articles on the Civil War in the Ozarks. Lou Wehmer is the chairman of the South Central Missouri/North Central Arkansas Civil War Roundtable. “The Civil War in the West has a single goal: to promote historical writing about the war in the western states and territories. It focuses most particularly on the Trans-Mississippi theater, which consisted of Missouri, Arkansas, Texas, most of Louisiana (west of the Mississippi River), Indian Territory (modern day Oklahoma), and Arizona Territory (two-fifths of modern day Arizona and New Mexico) but encompasses adjacent states, such as Kansas, Tennessee, and Mississippi, that directly influenced the Trans-Mississippi war. It is a wide swath, to be sure, but one too often ignored by historians and, consequently, too little understood and appreciated.